Register Log In GliderCENTRAL Forums Bonding & Relations Changes necessary?? Greetings gliderfolk. It's been a very long time since I've posted anywhere. As some of you already know, I just lost my sweet Bliss-a gift, along with her son Dalton, from Karin/Glider Daydreams when she became too ill to care for them. Dalton is now all alone in a very large cage he always shared with his mom. So, first questions-is there such a thing as a cage that's too big for one glider? Are her smells a comfort to him or a stressor? I also have another cage with two gliders-Leroy Brown and Lil Bit. Long story short, Leroy was a foster that turned into a first glider for a friend who lived with me for five years until he died of cancer on October 12. Lil Bit was the unintended product of a colony of 5 related gliders including 3 unneutered males. All 6 came to us as fosters in 2 cages, separated by gender until the boys were neutered shortly after we got them. Lil Bit shacked up with Leroy starting about 3 months ago. The remaining 5 fosters went home today. Second question-what's the chance that they could share a cage? Dalton and Leroy "met" several times when one was inside a zippered pouch and the other was outside. They were VERY interested/curious about each other. 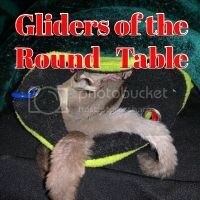 I'm worried that Dalton will be lonely and, honestly, at a few months shy of 70, I can deal with one set of gliders a lot more easily than two. Alternatives? Give Lil Bit and Leroy to the woman who has the colony? Find a new friend for Dalton? Keep Dalton as a bachelor? Tucker's mom here. There is no reason that Dalton can't go in with the other two with some time. I would start with deep cleaning his cage and washing everything that smells like Bliss. Clean the other cages fleece. After about a week start swapping pouches, I would do this for at least two weeks. Then try introductions in the bathtub some morning when you are going to be around for a few days. If they all go into the same bonding pouch then deep clean which ever cage they are going to share. Put in at least three sleeping pouches, give them Dalton's wheel so they have plenty of wheels. Keep us posted, I have other ideas if only one accepts Dalton.